Xabi Fernández and his in-form MAPFRE team claimed their second victory in Leg Zero qualifying with another commanding performance in the build-up to the Volvo Ocean Race. MAPFRE had a lead of seven nautical miles when they crossed the finish line at 0629 UTC off the iconic French sailing city of Saint-Malo. Team Brunel took second place in their first race sailing with new recruit Peter Burling, the Olympic gold medallist and America’s Cup winning helmsman, whose signing was announced just hours before the fleet’s departure from England’s south coast. Dongfeng Race Team, the Chinese entry with a French skipper, Charles Caudrelier, completed the podium to maintain their own excellent form in the series – and were followed by Vestas 11th Hour Racing, team AkzoNobel, Turn the Tide on Plastic and Sun Hung Kai/Scallywag. MAPFRE’s latest victory was barely in doubt in a race they dominated following a decisive moment shortly after the Plymouth start. “It’s a very good result for us, and it’s been a really good leg for us from beginning to end,” said MAPFRE skipper Xabi Fernández. 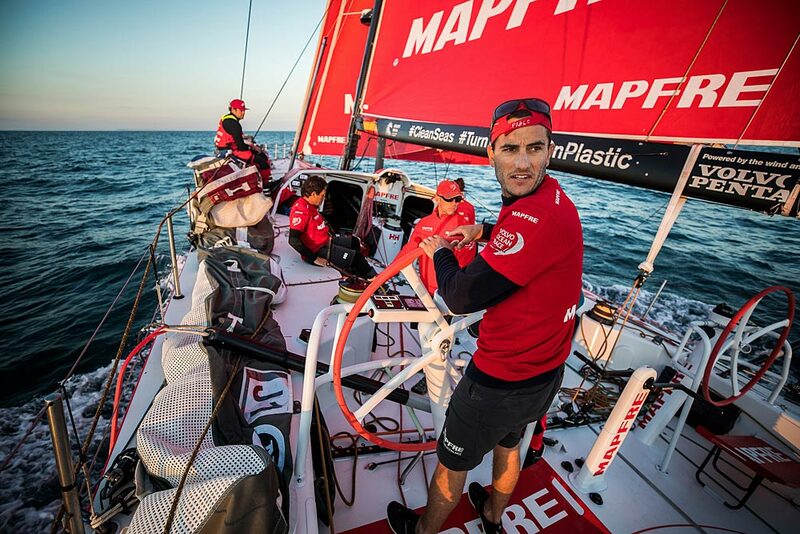 MAPFRE chose to dive south with Vestas 11th Hour Racing and Turn the Tide on Plastic. The others chose a route down the coast that required an exhausting gybing duel. 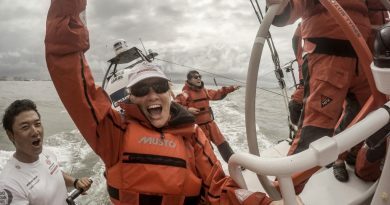 When the fleet came back together, the offshore option had paid off, and Brunel and Dongfeng Race Team switched sides to choose the southern option with MAPFRE and Vestas 11th Hour Racing. The fleet then had to negotiate a barrier of light winds that blocked the route. The calms were narrower in the south and the four boats that had invested in this option slowed but continued moving whereas Sun Hung Kai/ Scallywag went backwards on the tide, completely becalmed. After the turning mark by the Needles and a drag race across the English Channel, excitement awaited in the tidal acceleration zone next to the French coast. Just like stepping onto a moving walkway at the airport, the speeds on every boat jumped from 13 knots to 19 as they were pushed by a river of current in the ocean. From there, MAPFRE were never challenged. For Burling, it was a first experience of racing onboard a One Design Volvo Ocean 65 – and he said that the short race to France was the perfect introduction to the Volvo Ocean Race. “It’s been great to get out and race – I have a lot to learn but Leg Zero is a really good way for me to ease into this,” said the Kiwi. French sailing fans will now get to see the fleet of Volvo Ocean 65s in the inner harbour before a non-scoring Pro-Am Race on Saturday. “It’s great to be in Saint-Malo and back in France – the crowds on the dock gave the Volvo Ocean Race fleet an unforgettable welcome,” said Dongfeng Race Team skipper Charles Caudrelier. The teams will complete Leg Zero qualifying with a race from Saint-Malo to Lisbon, starting on Sunday at 1050 UTC and with an ETA of Wednesday. 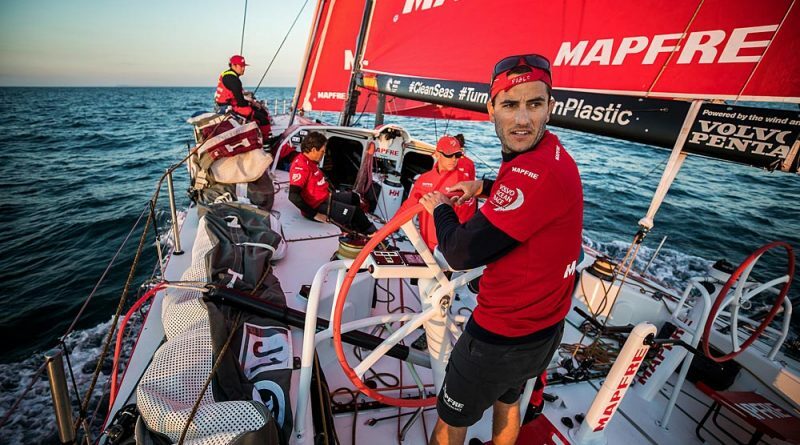 MAPFRE now have a three-point advantage at the top of the Leg Zero standings, with two wins and a runners-up spot from the three races to date. 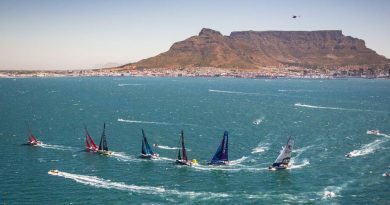 While an overall winner will be declared, no points will be carried forward to the Volvo Ocean Race itself, which starts on 22 October.